At EPO Dental Specialists, we’re willing to bet that nearly everything you’ve heard about a root canal is either false or at least slightly exaggerated. The truth is a root canal is designed to erase the pain of an infected tooth, prevent the spread of infection and help you avoid the need for tooth extraction. Furthermore, a root canal in Richardson is not at all painful itself! Let’s take a look at root canal therapy and understand how this common procedure can be the key to pain relief and tooth preservation. Whether you want to call it a root canal, root canal therapy or endodontic treatment, the procedure is the same. Our endodontist, Dr. Javier Ortiz, removes infection from inside your tooth, fills and seals the tooth and then creates a crown to protect what remains of your tooth. How Does Infection Get Inside Your Tooth? Millions of bacteria live in your mouth. At the center of each healthy tooth is the pulp chamber. 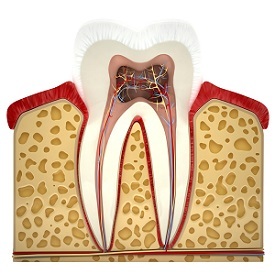 Here, blood, lymph and nerve tissue transport nutrients to the tooth and remove waste through root canals that connect to your bloodstream. The chamber and canals are normally protected by a tooth’s two other layers: enamel on the outside and dentin in the middle. However, if you have a large cavity, a loose filling, or a penetrating crack, then bacteria can access the pulp chamber. When this happens, infection may set in. Unfortunately, the leading symptom of an infected tooth is often severe pain. As the infection grows in your tooth, the accompanying inflammation is usually very painful. Sometimes, however, there aren’t any symptoms, which is why regular checkups are so important. Your dentist in Richardson will be able to see the infection on an x-ray if you’re not experiencing any recognizable symptoms. But more importantly, tooth infection can be avoided when cavities and others kinds of structural damage are treated in a timely manner. After the tooth and surrounding tissue are anesthetized, Dr. Ortiz accesses the pulp chamber and root canals in order to remove infection, debris and tissue. The area is then disinfected and filled with a biocompatible substance that expands to fill the chamber and root canals. This is needed to support the tooth and prevent recontamination. Lastly, the tooth is sealed and prepared for a porcelain crown that will protect your tooth. Some discomfort may be felt after root canal therapy. For relief, most patients only need a few doses of an over-the-counter pain reliever. Depending on the severity of infection, Dr. Ortiz may prescribe an oral antibiotic.